British actor Wesley Tremayne thinks he’s close to hitting the big time—a film career—with his role as a hunky explorer on a popular American TV show. Success should be just around the corner, as long as he keeps his sexual orientation a secret. Wes’s best friend and beard, Julia Compton, forms the other half of a glamorous Hollywood couple that’s merely a façade. Evan Taylor left his acting career behind five years ago without looking back. He's always been more comfortable around horses than people—especially Hollywood types. 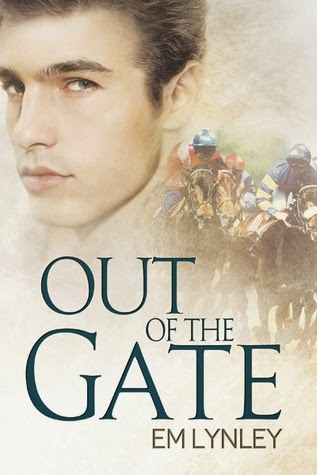 His new life training racehorses is a dream come true, but increasing financial problems and an abusive boyfriend have him doubting himself and his choices. Then Wes and his friends buy a third-rate racehorse—partially for publicity—and send him to Evan’s stable. Wes’s friendship with Evan soon develops into an overpowering attraction he can’t act on. He's never met a man like Evan, but if there’s any chance for a future together, Wes must choose between a career he loves and the man he adores. Once again, EM Lynley’s written a winner. We can feel the heat in the horses’ legs, we can smell the fresh-turned earth on the track, hear the roar of the crowds in the last furlongs of the race. Most of all, we can feel the heat between Wes and Evan. Wes has strong motivation to keep his orientation to himself: he’s sure his career as a budding Hollywood heartthrob won’t survive coming out. He’s aggravated with himself that the one man who’s shaken his resolve already has a boyfriend. Still, he can’t keep away from the training stables or Evan, even if all he can do is learn more about his new hobby. Being treated like a human being is a new one on Evan, whose relationship with the odious Gary has been steadily disintegrating and all that remains is to blow away the dust. He’s taken in by Wes’s charade with Julia, and cursing himself for finding the straight guy attractive. Being part of the Hollywood scene is another strike against Wes. Honest interest and attentive conversation are a powerful aphrodisiac. Bad boyfriend Gary, a filmmaker on the documentary end of the movie industry, does get the boot, but lingers like a bad smell given his half ownership in one of Evan’s horses. Evan can’t afford to lose any more paying customers, since several of his owners have taken their horses away. Gary’s filly, Jet, could be one of the stars of the stable. The relationship between Wes and Evan is a lovely dance of interest and self-denial until they can finally come together. After that, we get to watch them solidify as a couple who has each other’s backs. Really well done, and when they have to confront the mystery that runs like a shimmery thread through the story, it’s explosive. I love this author’s way with creating a fully formed setting that’s nearly a character in itself, and making it absolutely real. The needs of the stable affect Evan and Wes almost as much as they affect each other, making this one of the most three dimensional books I’ve read in a long time. Add in the baggage each man carries and their need for each other, and the story is beautifully well rounded.